Although you don’t need a belt to hold up your kilt, we’ll be glad to add ’em so you can wear your favorite belt. Belt loops can also be used to thread your sporran “chain-belt” through. This is the traditional use of belt loops on a kilt. TIP: Belt Loop size should be at least 1/4″ larger than the belt width in order to have room for the belt hardware, e.g., the keeper. “The Works Kilt” is our world-famous Sport Kilt with four custom options already included: Belt Loops, Sewn Down Pleats, Fringed front panel edge, and leather buckle strap closures. The material is the same great Sport Kilt poly-blend (no itch!) fabric with superb “swing” and “drape”. It’s Machine washable, non-wool and holds a crisp pleat well. Each also features our original velcro closure, and elastic in the waistband for comfort and fit, with just a bit of give. Each includes a inside stash pocket 5×6″ behind the front panel. Please allow about 3-5 days to complete, plus shipping time. Longer than standard length kilts are made from scratch, and can take up to 2-3 weeks to complete. Please note: Since this is a custom made garment, generally we cannot accept returns or exchanges, unless we make a mistake. However, we want everybody to be happy with their kilt, so let us know if you have sizing issues once you receive your kilt. Please measure carefully. 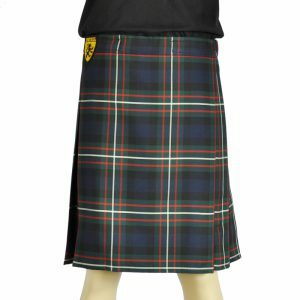 If you need a longer length kilt, or a larger model than what we offer online, feel free to call in your order to 1-800-451-KILT.